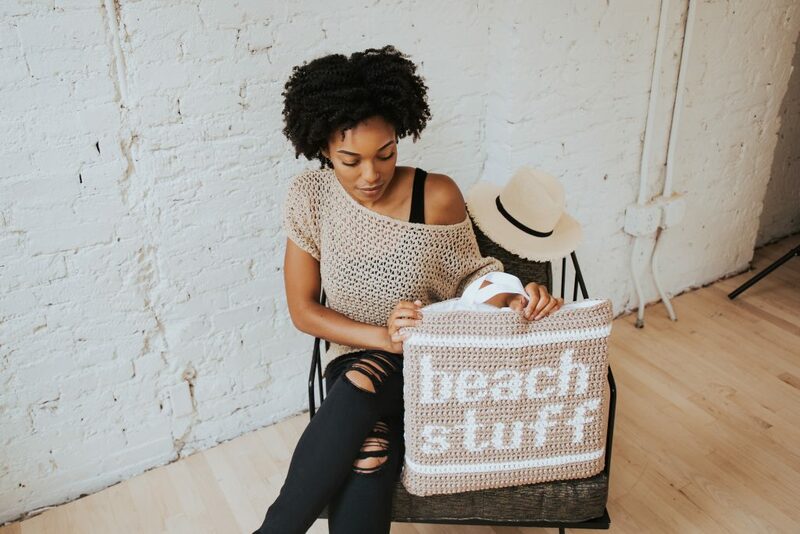 Have some fun with tapestry crochet and even practice your hand sewing skills with the fun and practical Beach Stuff Tote! 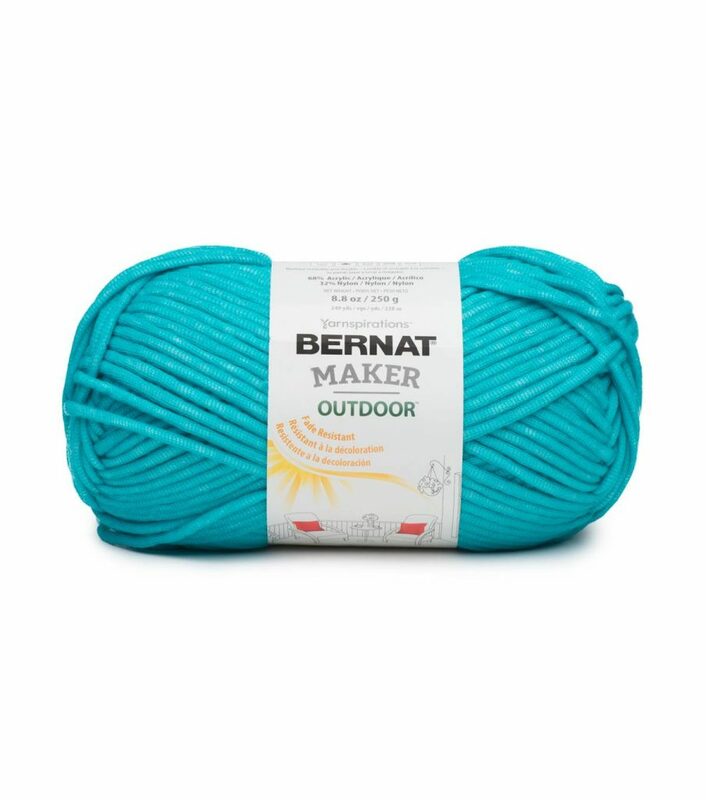 It was love at first sight when I found Bernat Maker Outdoor at my local JOANN craft store. The vibrant colors of this chainette yarn were calling out for a fun summer project. 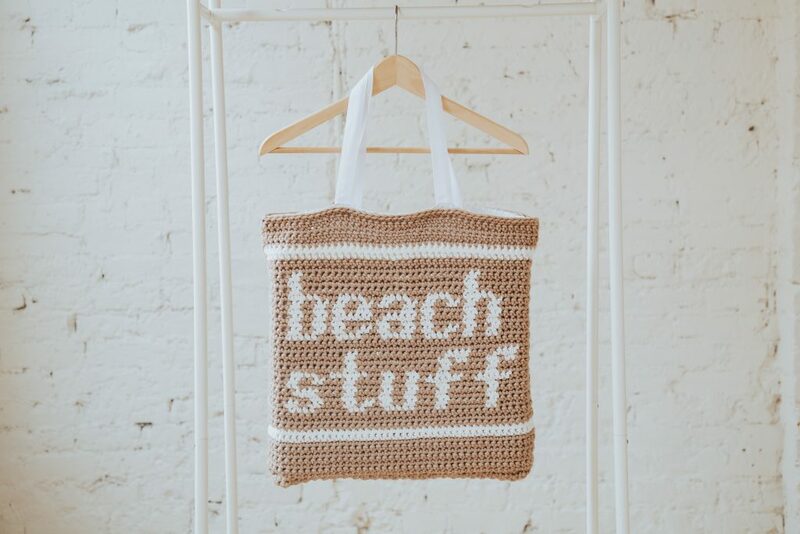 Just hours later, I had the perfect bag for all of my beach essentials. 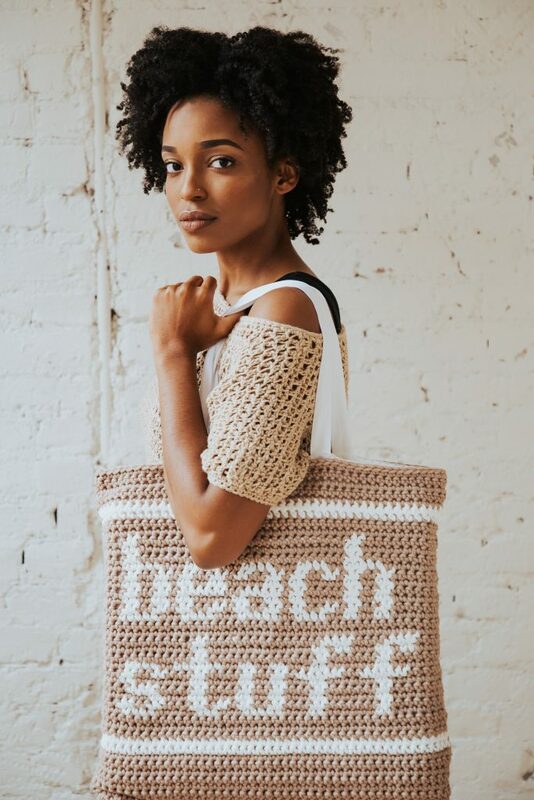 Find a printer friendly, PDF version of the Beach Stuff Tote on TLYarnCrafts.com. PDF version includes full-color, 6 page instructions and easy to read chart. The summer season always reminds me of crazy beach days and spending time with family. I grew up in a suburb of Detroit, surprisingly close to over a dozen adorable lakefront beaches. I have fond memories of splashing in the waves with my brothers and cousins, counting our summer freckles and eating popsicles. Now that I’m a grown-up (ha! ), beach days look much different. 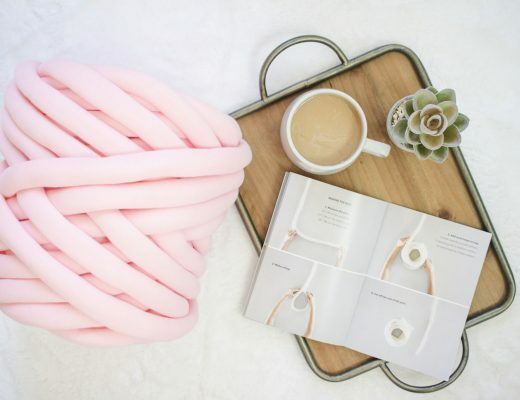 They’re a little lazier and involve plenty of relaxing and crochet. It’s helpful to have a big tote to carry all of my supplies with me – e-reader, sunglasses, plenty of water, works in progress… Seriously, the list goes on and on. 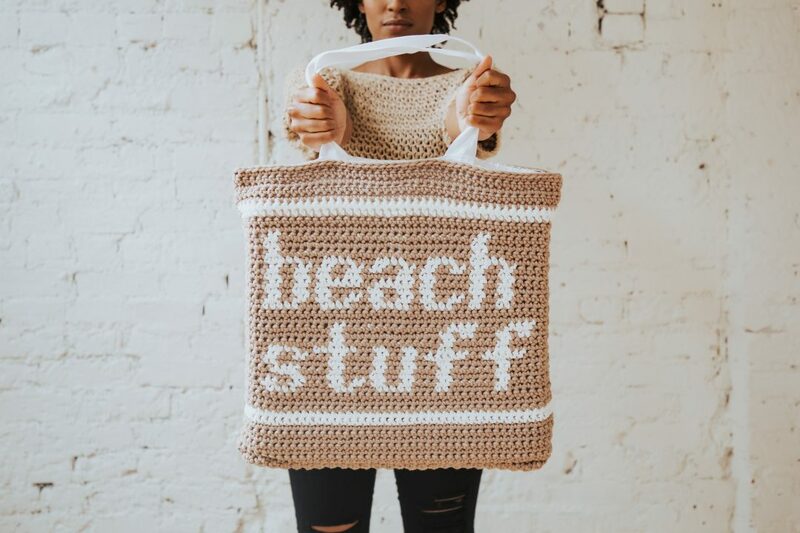 The Beach Stuff tote is just that – the perfect catchall for the odds and ends you need for the ideal day on the sand. 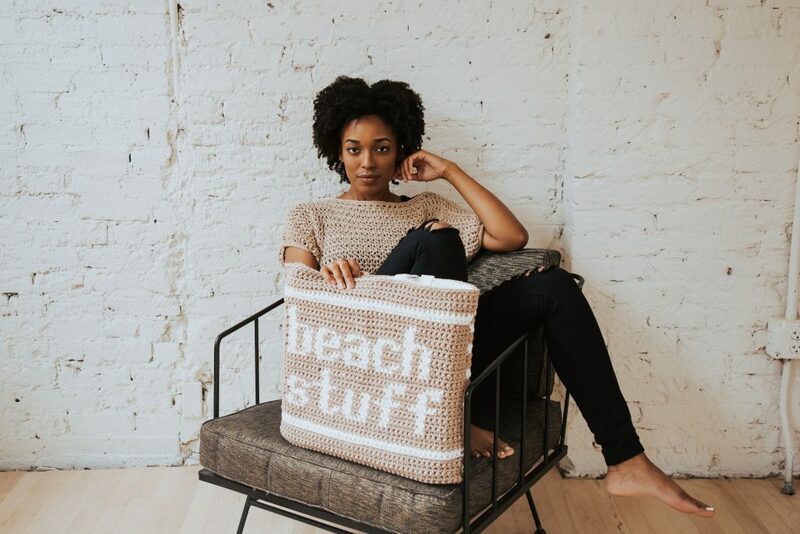 I’ve just returned home from a refreshing girls’ trip to Miami with my best friend and my Beach Stuff tote was with me at all times. It was the perfect size for every part of the trip. I used it as a carry on for the plane, for the souvenirs I bought at the darling gift shops, and for our multiple day trips to the sparkling beaches. 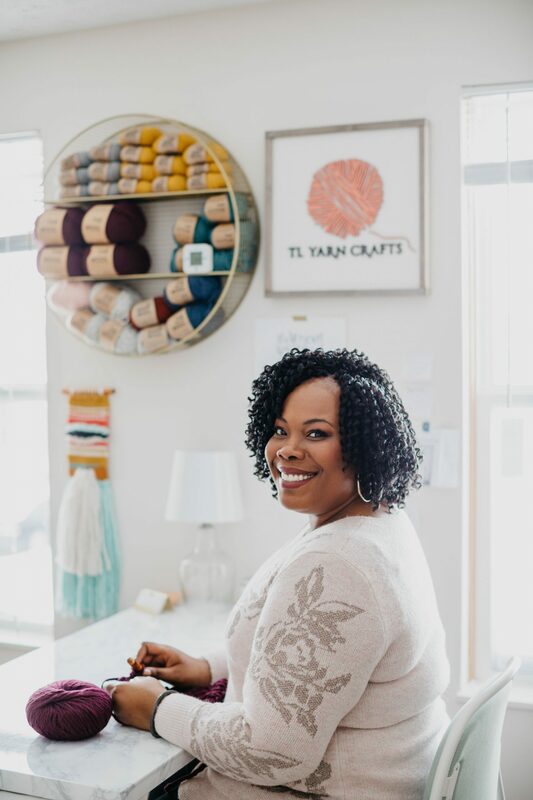 When I design, the idea for the project usually comes first, then I go to find the perfect yarn. In this case, the whole process was reversed. I first found Bernat Maker Outdoor during a random trip to JOANN. The endcap leading to one of the yarn aisles had these skeins and cakes of vibrant red, teal, gray, and tan that I’d never seen before. I was drawn to it immediately and loaded up my cart. Bernat Maker Outdoor is an acrylic/nylon blend advertised to be fade resistant and machine washable and dryable. The structure of the yarn is a chainette. This means that the outer layer of the yarn is machine knit into a tube. For this yarn, a soft fiber is blown into the tube to give it structure. 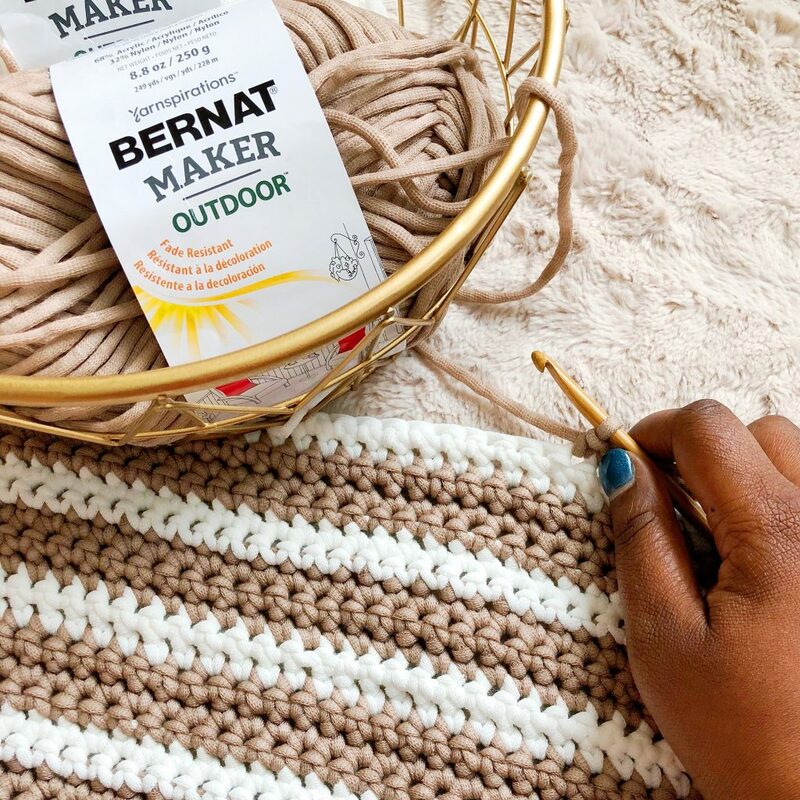 Bernat Maker Outdoor is incredibly soft, easy to care for, and a complete joy to work with. 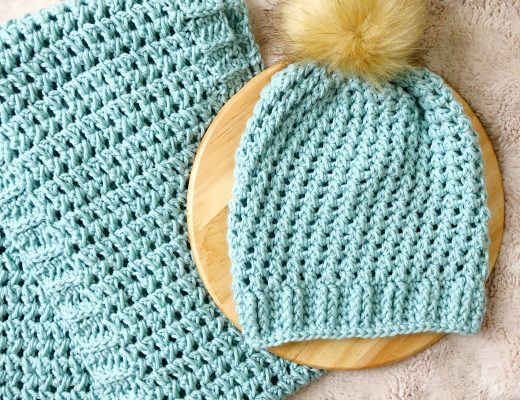 The stitch definition with crochet is amazing! 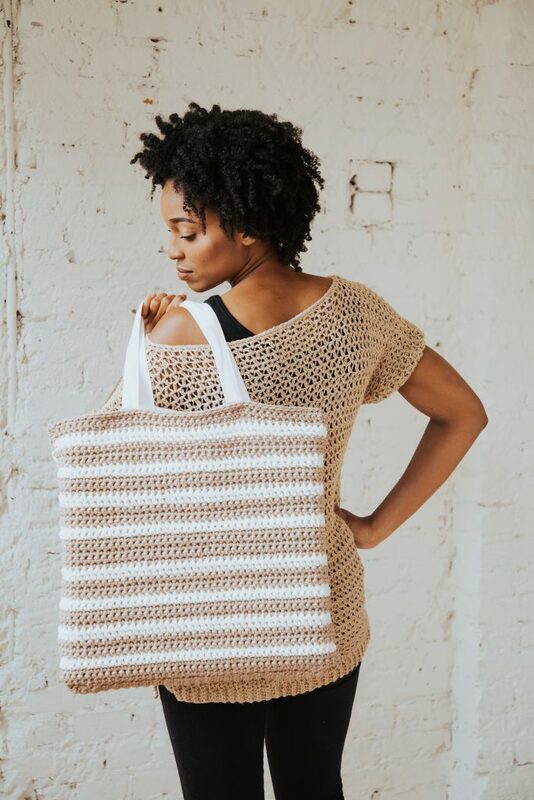 My biggest pet peeve when it comes to crochet bags is how they tend to stretch, particularly around the handles. To solve this problem, I lined the Beach Stuff Tote with a canvas tote bag, also found at JOANN. Why hadn’t I thought of this before?! 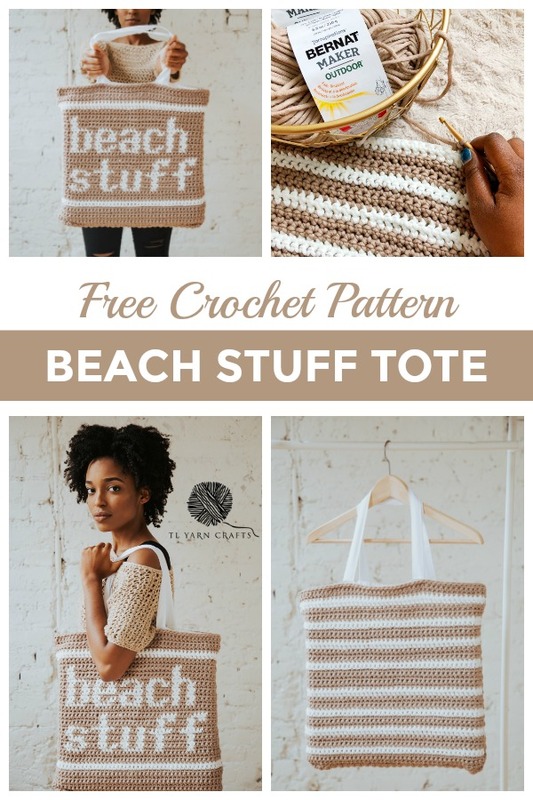 Make a crochet tote as normal then hand sew the canvas tote inside! This way, the bag keeps its integrity and is super cute. A win-win! 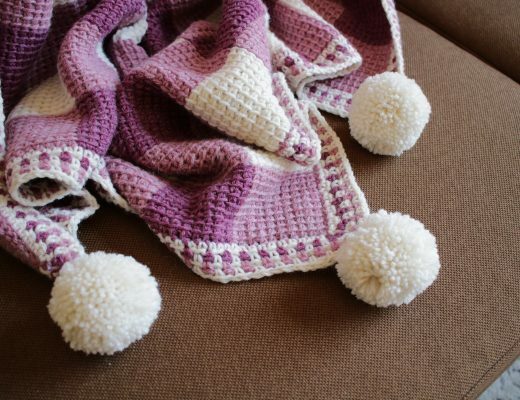 This pattern uses the tapestry crochet technique. Yarn not in use is carried through single crochet stitches instead of behind them. Color changes on the front panel are written as follows: 2A, 6B, 12A, 9B would mean 2sc with color A, 6sc with color B, 12sc with color A, and 9sc with color B. Row 2: Ch 1. Turn. Sc in each st across row. Rows 3-52: Repeat Row 2. Cut yarn, leaving a long tail for weaving later. Rows 2-7: Ch 1. Turn. Sc in each st across. Rows 8-9: With color B, ch 1. Turn. Sc in each st across. Rows 10-12: With color A, ch 1. Turn. Sc in each st across. Row 13: With color A, ch 1. Turn. 7A, 2B, 6A, 2B, 3A, 5B, 3A, 3B, 5A, 4B, 5A. Row 14: With color A, ch 1. Turn. 4A, 2B, 2A, 2B, 3A, 2B, 1A, 2B, 1A, 2B, 2A, 2B, 3A, 2B, 6A. 2B, 7A. Row 15: With color A, ch 1. Turn. 7A, 2B, 6A, 2B, 3A, 2B, 2A, 2B, 4A, 2B, 3A, 2B, 8A. Row 16: With color A, ch 1. Turn. 5A, 4B, 4A, 2B, 4A, 2B, 2A, 2B, 3A, 2B, 6A, 2B, 7A. Row 17: With color A, ch 1. Turn. 7A, 2B, 6A, 2B, 3A, 2B, 2A, 2B, 4A, 2B, 7A, 2B, 4A. Row 18: With color A, ch 1. Turn. 4A, 2B, 2A, 2B, 3A, 2B, 4A, 2B, 2A, 2B, 1A, 6B, 2A, 6B, 5A. Row 19: With color A, ch 1. Turn. 7A, 2B, 6A, 2B, 3A, 2B, 2A, 2B, 2A, 6B, 2A, 4B, 5A. Row 20: With color A, ch 1. Turn. 13A, 2B, 13A, 2B, 6A, 2B, 7A. Row 21: With color A, ch 1. Turn. 4A, 2B, 1A, 2B, 3A, 2B, 1A, 2B, 13A, 2B, 13A. Row 22: With color A, ch 1. Turn. 13A, 2B, 14A, 4B, 4A, 4B, 4A. Row 23-24: With color A, ch 1. Turn. Sc in each st across. Row 25: With color A, ch 1. Turn. 7A, 2B, 2A, 2B, 2A, 4B, 2A, 5B, 3A, 4B, 3A, 5B, 4A. Row 26: With color A, ch 1. Turn. 4A, 2B, 2A, 2B, 1A, 2B, 2A, 2B, 1A, 2B, 2A, 2B, 1A, 2B, 2A, 2B, 1A, 2B, 2A, 2B, 7A. Row 27: With color A, ch 1. Turn. 7A, 2B, 2A, 2B, 5A, 2B, 1A, 2B, 2A, 2B, 5A, 2B, 1A, 2B, 2A, 2B, 4A. Row 28: With color A, ch 1. Turn. 4A, 2B, 2A, 2B, 1A, 6B, 2A, 5B, 1A, 2B, 5A, 2B, 2A, 2B, 7A. Row 29: With color A, ch 1. Turn. 7A, 2B, 2A, 2B, 5A, 2B, 1A, 2B, 5A, 2B, 2A, 2B, 1A, 2B, 2A, 2B, 4A. Row 30: With color A, ch 1. Turn. 4A, 2B, 2A, 2B, 1A, 2B, 2A, 2B, 1A, 2B, 2A, 2B, 1A, 2B, 2A, 2B, 1A, 2B, 2A, 2B, 7A. Row 31: With color A, ch 1. Turn. 7A, 5B, 2A, 4B, 3A, 4B, 3A, 4B, 3A, 5B, 4A. Row 32: With color A, ch 1. Turn. 4A, 2B, 26A, 2B, 11A. Row 33: With color A, ch 1. Turn. 11A, 2B, 26A, 2B, 4A. Row 34: Repeat Row 32. Row 35-36: With color A, ch 1. Turn. Sc in each st across. Rows 37-38: With color B, ch 1. Turn. Sc in each st across. Rows 39-43: With color A, ch 1. Turn. Sc in each st across. Note: All seaming done with a whip stitch unless otherwise noted. Step 1: Weave in all ends. Step 2: Hold Front and Back panels with right sides facing each other. Seam sides together, leaving top and bottom open. Step 3: Seam Bottom Panel to bottom of Front and Back Panels. Turn bag right side out. 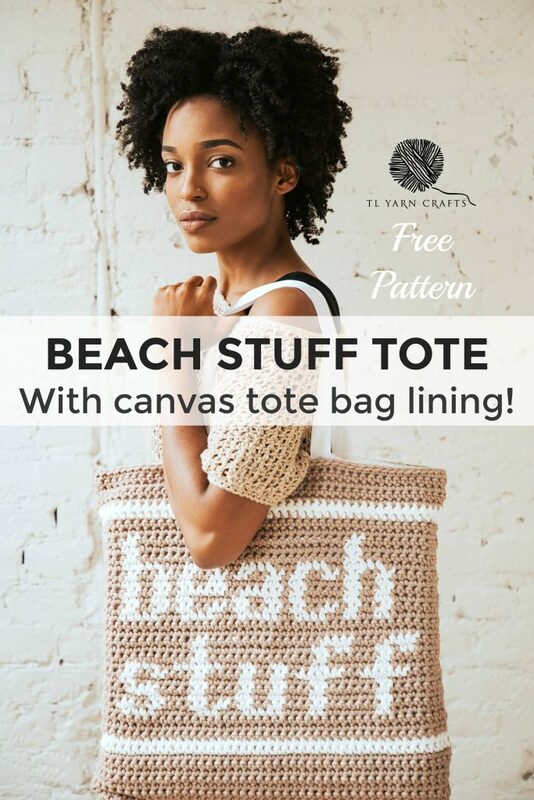 Step 4: Insert canvas tote bag into crocheted bag. Step 5: Position canvas tote top hem to just below top row of crocheted bag. Use ball head pins to pin bags to each other evenly around. Step 6: Hand sew canvas tote to crochet bag using pearl cotton and sewing needle using the blanket stitch. Step 7: Secure remaining thread and sew in any remaining ends. 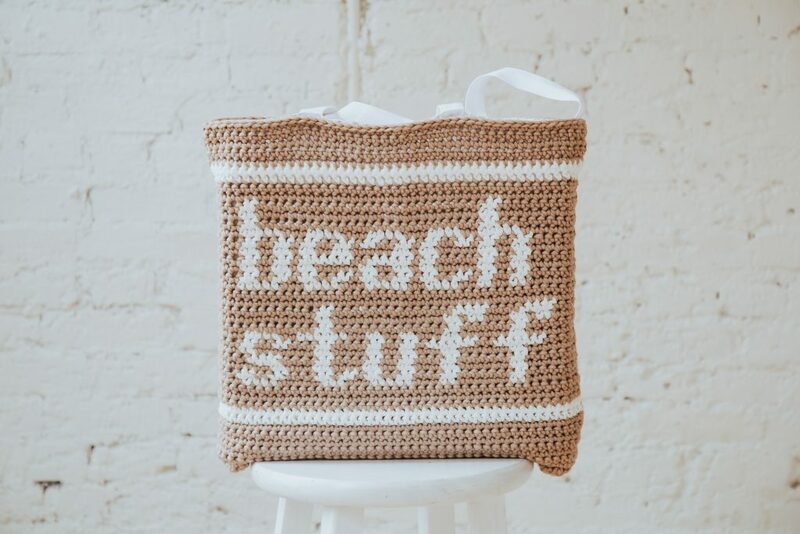 Purchase the printable PDF Beach Stuff Tote pattern HERE! 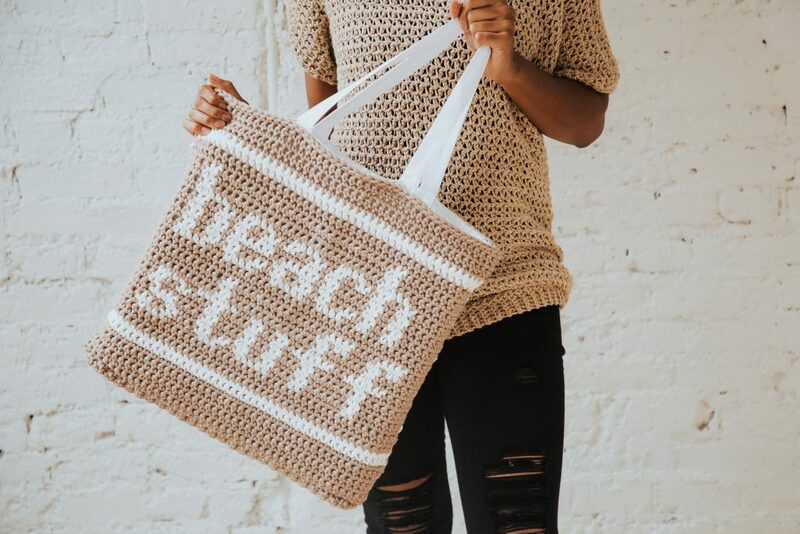 Having fun with your Beach Stuff Tote? 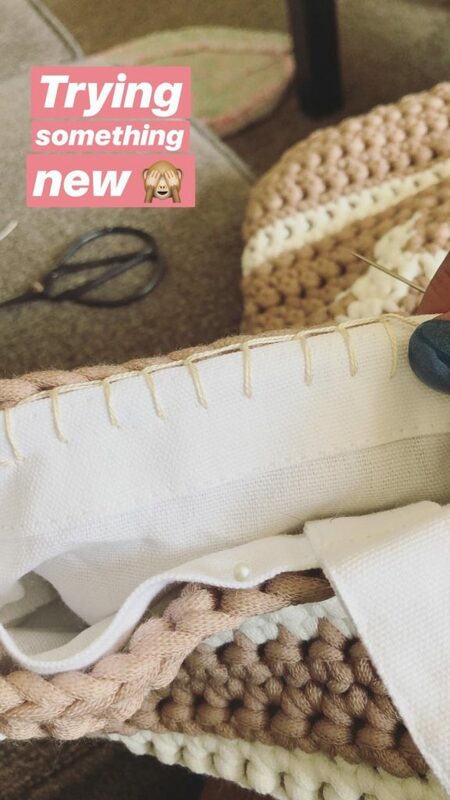 Share your works in progress and your finished projects with me on Instagram and Facebook using the hashtag #TLYCMakers for a chance to be featured on my feed! 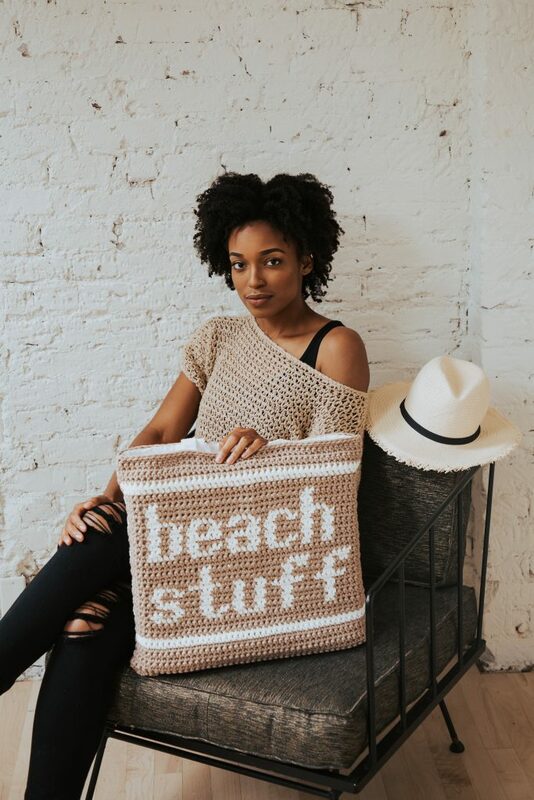 Looking for more summer crochet patterns to try? Check out the Lemonade Top, the Free Yourself Shawl, and the Denim Breeze Vest! I have just completed the three parts to this bag, and noticed that has 43 rows, and rhe back has 45. Is this correct? If not, what is missing? Hi Charlene! Thank you so much for pointing this out! I’ve just updated the blog post with the correct pattern.